Learning how to select colors that represent our client’s personality and then blending them to create the perfect background for the space is always so much fun…especially when it comes to using bold colors. Whether you’re using them on the ceiling or as an accent wall, color adds an extra visual dimension to the room. 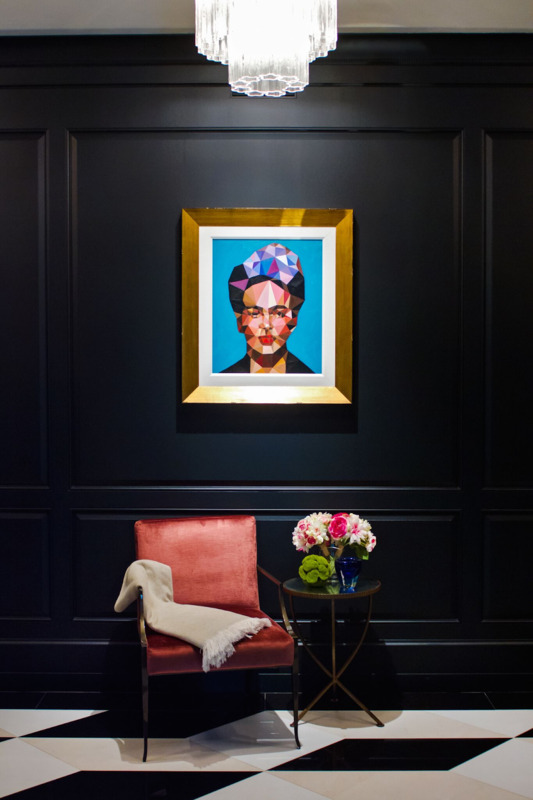 Here are a few of my favorite spaces that use daring and eye-catching colors beautifully. 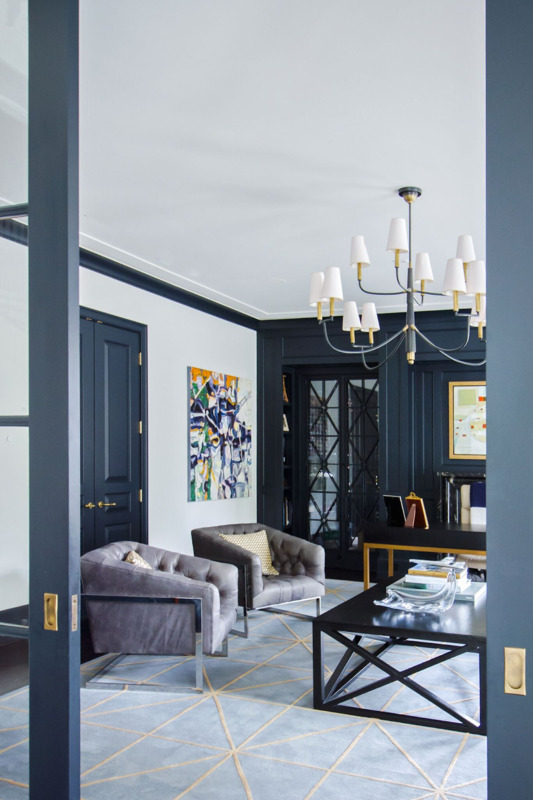 Painting an entire room in a deep color, such as black or midnight blue, may seem counterintuitive because it makes the space feel small but for a media room, it’s perfect! In a space where the intention is to keep the light out, the dark color makes it feel more like you’re in a big movie theater and gives the room a cozy, intimate feel. Whereas a dark color used in a juxtaposition with a large bank of windows allows lots of natural light into balance out the dark walls. The ceiling is often a forgotten space, but it’s the ideal spot for an unexpected visual surprise. Painting the ceiling in a complementary color to the wallpaper or the style of the room ties everything together gorgeously. 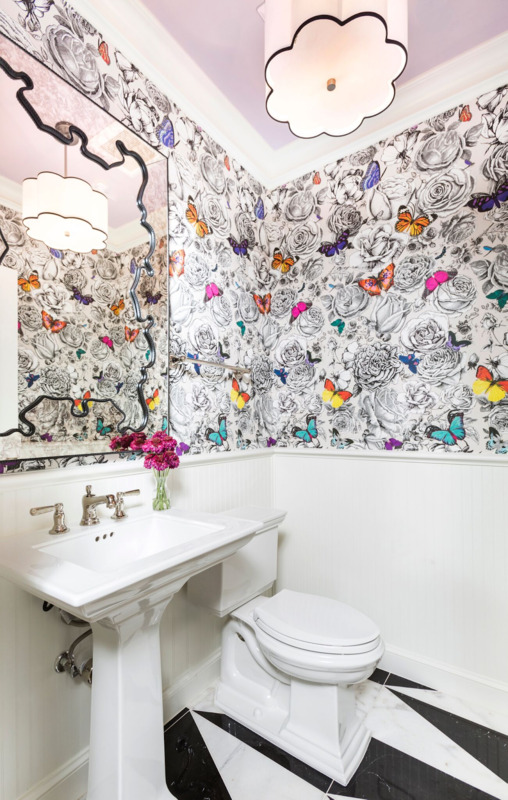 A playful color like the lilac in this powder bathroom draws your eye to the sweet light fixture and gives your eye a restful place to land among the patterned wallpaper. You can never go wrong with an accent wall. Let the wall be the focal point and avoid using colors that compete in the space. Neutral furniture and accessories will make a saturated accent wall pop beautifully. 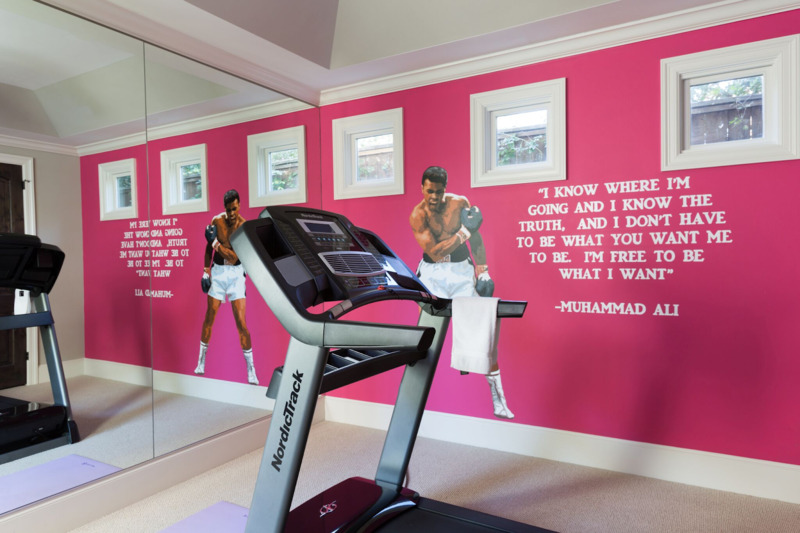 The hot pink wall in this home gym definitely shakes up the space and gives it a very empowering vibe. Paint may be the first thing you think of when talking about using color in the space, but wood finishes can also be a unique way to bring in color. Using an Aubergine finish on these custom built-ins adds a rich, sophisticated element to this home office. The fun blue armchairs paired with a neutral ceiling keep the room from feeling closed in and overwhelming. The key to using color is balance. Mixing bold hues with neutrals and lighter tones ensures that the space is well-balanced and easy on your eye. Whether you decide to add color on your ceiling, use it on the walls or in the wood finishes, use each color to add depth and character to the room’s story. For more inspiration on how to use color in your designs, you can see more of our projects on Instagram and Pinterest. Awe-inspiring design inspiration! We always appreciate reading your blogs, and thus featured this one on Studio Designer’s Twitter — take a look!